Ten years ago, I had the good fortune of participating as a member of a five-member MARLANT Bataan Memorial Death March, Heavy Division, Co-Ed marching team. 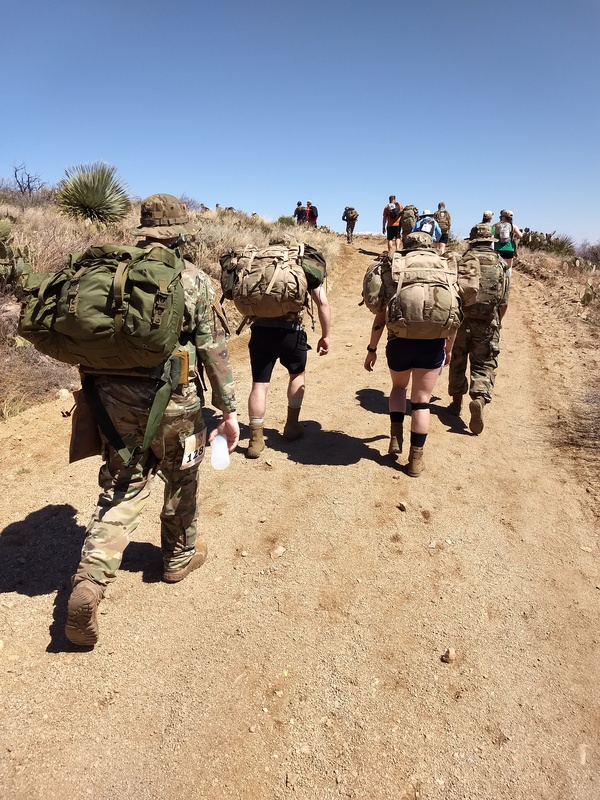 A team in which each member trained to carry 35 pounds of dead weight, plus 15 pounds of required gear and food for 42 kilometers. Forty-two kilometers in the fastest time possible across a desert and up and around a mountain elevation of approximately 1km. That year our team, called the Halifax Heavies, came in second against many others in the same division. Essentially since 1992, the United States Army installation, White Sands Missile Range located east of Las Cruces, New Mexico, has been the host to the event in remembrance of the American and Filipino soldiers of the Second World War who were forced by the Imperial Japanese Army to march 65 miles through jungle terrain enduring torture, dysentery, malaria, diarrhea. Thousands died from the rough conditions and mistreatment while others died in the prison camps similar to those inhabited by Canadian POWs after the fall of Hong Kong. 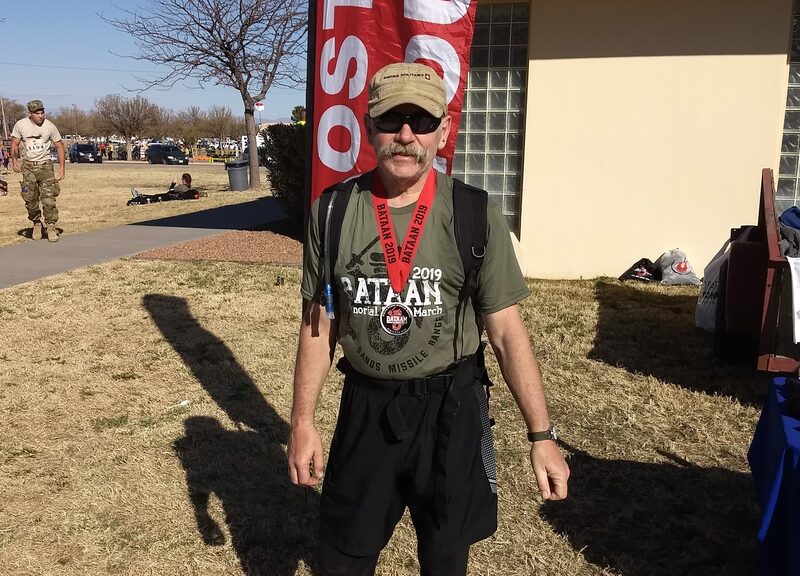 This year, I was able to participate as an individual in the light weight civilian category starting off with the Wounded Warriors, the same as our Soldier On program. Ten years ago, the number of folks participating in the event was 5,300. This March 17 race, it was 8,631 participants. We started off Sunday morning at 7 a.m., a crisp and cool morning following a snowy Saturday. The course begins with 10 km of level desert trail followed (400-1312 meter) climb up around Mineral Mountain for 10km and skirting the area where the first atomic bomb was tested (Trinity). Then 10 km down the level basin and 10km across the sand pit desert area to the finish line. There were many water stations along the way with Gatorade, fruit and ambulance on the ready. The slogan many carried was, when it gets tough, keep marching, and so we did until we reached a canopied finish line outside the base’s Frontier Club. There were only four Bataan veterans of the original march alive today, three of whom were there to see us off. Though the 42 kilometers isn’t at all like the real march, it does give you the feeling of respect and honour the Americans have for their veterans who suffered from this twisted reality of war. For the Canadians who marched this year at the Bataan, we have a deeper feeling a respect for our veterans captured at Hong Kong and who suffered the same treatment by the Imperial Japanese Army. Despite the reason for this march, it is always wonderful to march with brothers and sisters in arms.